Writing – Help! I am addicted to binders! Yesterday I wrote how I suffer an unreasonable addiction to Post-it® Notes. Today I will admit to my second writer’s addiction – binders. I have a vast collection of binders of all kinds, sizes and styles filling several large bookcases in three rooms of my little house. There has not been a three-ring binder that I have not generally been able to use. I have mostly your standard three rings (I strongly dislike binders with more than three rings) binders but lately due to over stuffing some of the smaller binders, I have been getting d-ring binders which I find far superior. Thankfully, I married a patient and understanding woman who happens to be also a very good carpenter. My wife has actually helped me acquire, improve and better arrange my collection of binders. She is also the main designer and builder of all of the wooden shelves in our house. Because my wife and I are both bibliophiles, my collection of binders is second only to our joint collection of books. I have a large collection of note filled pages of and material that I wrote going all the way back to my earliest days of computer abuse (which may yet be another subject for a later post). Being the sort of person with a serious creative bent that I am, I almost immediately began to write material for my favorite genres (fantasy and science fiction – also subjects of yet another post). 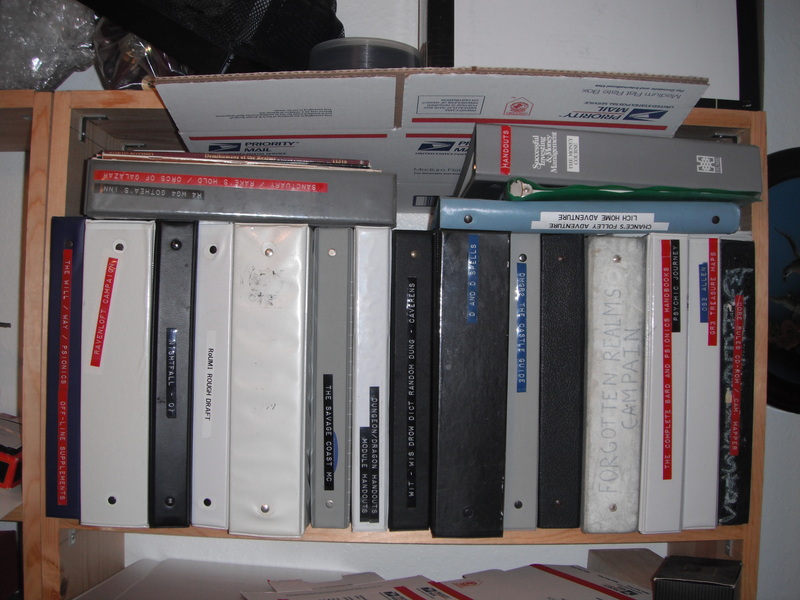 After a while I began to amass a large collection of printed material, because in those dark early days of PCs, document storage was not as plentiful or as reliable as it is today. You would be amazed at how many 8”, 5.25” and 3.5” floppy discs it took to store documents back then. You would also be amazed at the failure rate of those early marvels of computer storage, and how often they completely lost everything you put on them. The ease, convenience and inexpensive computing devices available today were a mere dream when I first started writing and collecting reference material. During the early years of my military career, I had come to play and enjoy certain role-playing games (which is yet another whole post for some later date and yes I am one of those geeks). Before the advent of the Microsoft Xbox, Nintendo Wii, Sony PlayStation® and other console games played at home, people who played games actually had to meet face to face (gasp! human interaction – oh the horrors!) to play games. I have material printed on noisy monster ribbon dot matrix continuous feed printer paper that is so faded as to be nearly illegible. I have papers printed on a variety of the earliest laser printers, most of which are still quite readable if one ignores the skips and streaks. I have always been interested in recycling and was doing the “green thing” long before it was a concept or fashionable. For some unfathomable reason, I have a lot of my material that is printed on the back of used paper taken from my class lecture handouts, various military service school course instructions, and almost any other suitable white paper I could run through a printer. It would be nice one day to be able to get rid of those pages of papers so that while reading some interesting fact or idea on one side on the other side I am not looking at the course instructions for operating an Aegis LMS-11 link system. I have not yet completed an inventory of the contents of all of my binders, but it is a goal that I hope to accomplish someday. I do have most of the spines of my binders decorated and labeled so I have a clue as to what the binder might contain. With the amazing developments in personal computers and portable scanners, I eventually hope to transfer most of my binder collection into a program like Microsoft® One-Note 2010. This website www.43folders.com offers some excellent hacks for note pads. Granted his penchant is for the expensive Moleskine-brand note pads whereas mine is for the super cheap steno note pads, but some of his hacks are applicable no matter your preference for note pads or binders. Any one else have a binder fetish? as an aside – enough already! get back to work, pleasing your minions. Ruth needs a heavy breather episode to clean out her pipes and relax her. Thanks Phil, no worries next Ruth entry is in final editing now. From the looks of your binders you are into fantasy. Correct Gandolf although that is one shelf of many randomly chosen.